Troubleshooting your Samsung Galaxy S5 can sometimes become a hassle especially if you don't know what to do. While most users encounter software problems, there are a few instances that hardware may be to blame. Common hardware issues usually discussed in many forums include, but not limited to, battery drain, unresponsive touchscreen, lag, and slow performance issues. These problems often result to a phone replacement request or repair. Any average user would rather have someone check their phone for them, or better still, simply get it replaced instead of having to spend time worrying what to do next. While we recommend such action, we in Droidista also feels that you deserve to know what is wrong with your device by checking or diagnosing the issue first hand. Fortunately, there's a handy and free way to do just that before deciding whether or not to ask for a replacement device or send the phone to a local electronics shop. You only need to pull up the service menu in your phone and access the appropriate option to know what is specifically wrong with your hardware. Now, before you proceed, you should know that the service menu is intentionally hidden by manufacturers from end-users for a reason. This menu is designed for technicians and engineers so they can do their job efficiently. Another reason is that some codes can do modifications to the phone like wipe everything off, or change some parameters that may negatively impact user experience. If you don't know what you are doing, do not dial any code! The usual way to access the service menu is done by simply opening your phone's dialer app and tapping *#0*#. Other codes are used for other service functions. 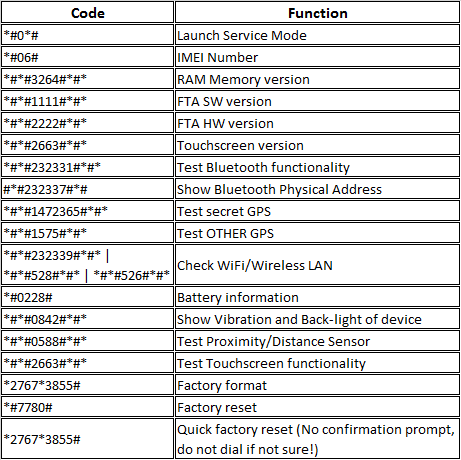 Below is a list of codes to diagnose hardware issues on a Samsung Galaxy S5 using the service menu. Keep in mind that some service menu codes are specific to a carrier so they may not work on another S5 from another vendor. Some carriers also block access to the service menu so if nothing happens when you dial *#0*#, you're out of luck. Thanks for spending your time reading our blog and keep watching for more helpful Android tips and tricks in our upcoming posts!